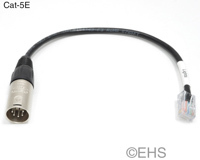 This is our custom-built adapter cable for lights that use RJ-45 CAT-5 for DMX input and output or to use installed CAT-5 wiring for your DMX lines. Construction is with a black stranded CAT-5 wire, top quality RJ-45, and Neutrik XLR connector. There is an optional label at the RJ-45 end to ID the pinout used. There are multiple pinouts for the RJ-45 end of this adapter. In the field below "Gear Pinout" please select the pinout you require, ESTA is the most common pinout. Please select ESTA for a pass-through set. If pinout is not listed please in the "Gear Make/Model" provide us the make and model of the gear at the RJ-45 so we can confirm the pinout (example: Color Kinetics PDS-60). Omission will result in an order delay while we contact you. The optional pinout label is to indicate the gear make / pinout for easy identification of these cables if you require multiple cables with multiple pinouts.